Idaho Fish and Game says three reservoirs in the Boise River system have a lot to offer anglers. BOISE, Idaho — Did you know that some of the best kokanee fishing Idaho has to offer is just a short drive from Boise? They provide some of the best kokanee salmon fishing the state has to offer as the 2019 season gets underway. 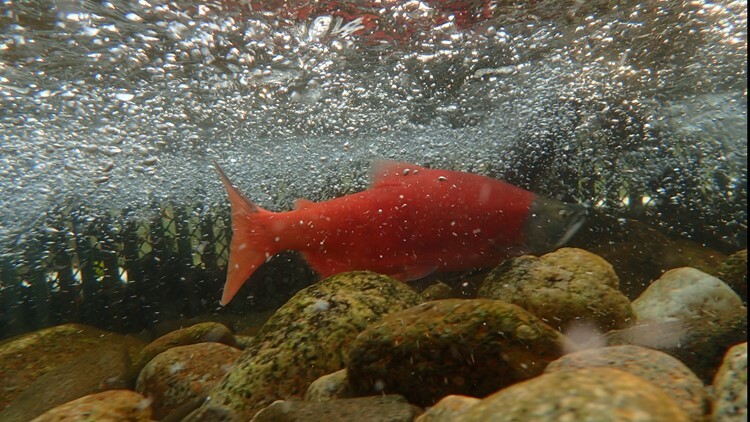 Officials say kokanee salmon’s popularity continues to grow across the West. Kokanee are prized for their fighting ability and great table fare. Fish and Game says each reservoir offers something a little different for anglers. Lucky Peak is the closest for Treasure Valley residents, but it can get a little crowded, particularly in the summer. "When Lucky Peak is rolling, there could be 30 to 40 boats on the water fishing on any given weekend morning," said Fish and Game regional fisheries biologist John Cassinelli, whose work encompasses both Lucky Peak Reservoir and Arrowrock Reservoir. Access can be a little trickier upstream at Arrowrock Reservoir. However, Arrowrock kokanee tend to be slightly larger than those at Lucky Peak, and the reservoir tends to be less crowded. Anderson Ranch is higher in elevation than the other two reservoirs, but typically has the greatest abundance of kokanee. "Because kokanee are very density-dependent, the fewer there are, the bigger they tend to get. There are fish in excess of 16 to 17 inches that are coming out of those reservoirs right now," he said. In addition to kokanee, Anglers at Lucky Peak and Anderson Ranch have an opportunity to catch a fall Chinook salmon, which Fish and Game has stocked in small numbers. All three reservoirs are also stocked with rainbow trout.